Lee Decker has never minded rodents or insects. "I was always interested in bugs and playing in the dirt and stuff like that. Nothing's ever bothered me," said Decker, who was raised in the small town of Northville, N.Y., just west of Saratoga Springs. "I grew up around mice — not in a disgusting way, but I lived in the woods, so there were always critters around." Decker, 26, has trained as a dental technician and worked as a licensed wildlife rehabilitator in the Adirondack Mountains. 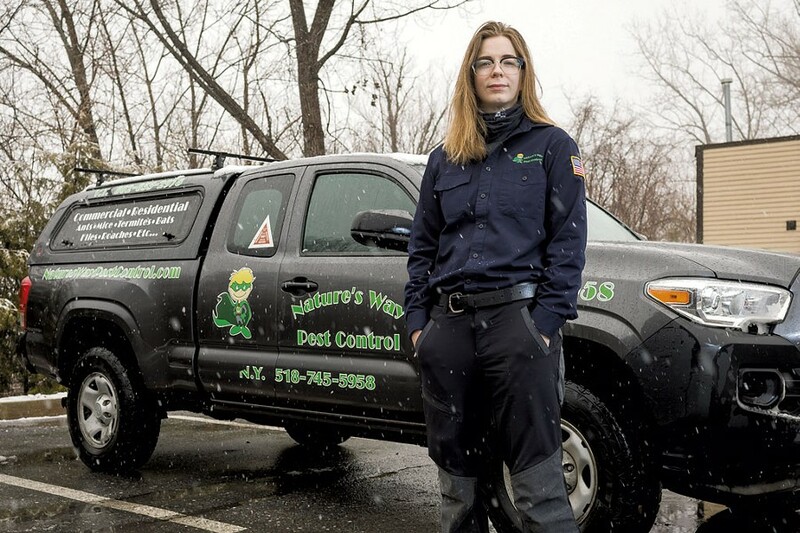 When she changed careers and became a technician with Nature's Way Pest Control, she already understood many of the animals she would encounter in her job. Nature's Way uses primarily nontoxic and eco-friendly methods to control unwanted visitors in people's homes. That was "a huge selling point for me," Decker said. "It's a huge selling point for why people hire us, as well." Most of the remedies in Decker's toolbox contain essential oils, including capsaicin, which keeps rodents away; and pyrethrin, derived from chrysanthemum flowers, which controls carpenter ants. In warmer weather, she mists down lawns and gardens with cedarwood oil, rosemary and thyme to control ticks. Decker covers a huge area, spanning from St. Albans to Montpelier. That's because Nature's Way is based in Glens Falls, N.Y., and Decker is its only full-time Vermont technician. Aside from her new trainee, she's also the company's only female tech. She was surprised to discover how many men are squeamish around creepy-crawly things. "A lot of people shuffle through this job and realize it's not for them," said Decker, who's been doing it for almost three years. "A lot of guys think they don't have the squeamishness for pest situations — until we go in, and then they realize, I don't think I can do this." For her part, Decker is an enthusiastic supporter of her company and its approach. "We practice what we preach. Eco-friendly methods have been around since the early 1600s with botanical pesticides," she said. "So we're sort of going 'backward' technology-wise, but I think it's the path forward." SEVEN DAYS: What are the worst situations you've encountered? LEE DECKER: Probably the worst ones are the folks without a lot of cleanliness or sanitary conditions, like hoarders. That's when it gets tricky, because how are you supposed to communicate to this person with a terrible pest problem that no chemicals on Earth are going to take care of the problem they have? I have to explain to them that their living conditions have to improve, but not offend someone with a mental illness. A lot of it is customer care and communication, and you really have to be a peacemaker on top of taking care of the pests. SD: Are there situations that made your skin crawl? LD: Some of the crawl spaces are really tight, and that can get scary. Especially if you've never been under a house, crawling around in the dirt can be really spooky. And sometimes there's a critter running through, like a rat, and you're just sitting there holding your breath. I've also had situations that made me completely disgusted, to the point where I needed to take 20 minutes and just chill out. A lot of those are bedbug situations where it's so bad, they're falling off the ceiling. SD: How do people react when you tell them what you do? LD: I get mixed reactions. Some people are really interested in it, but other people shy away from it. People are either really enthusiastic [to discuss it], or they're terrified. There's no real middle ground. SD: Your most unusual call? LD: One of the funniest and weirdest calls we ever got was from this woman who had a house with metal siding. She was like, "It's so weird. [This noise] happens every single morning, and it's only in this wall, and I know there's something living in there." What I figured out was that when the sun would heat up the metal siding, it would crack and pop, and she'd just moved in and didn't recognize all the weird noises. So each one is a little puzzle to be solved. It's really interesting and a lot of fun. SD: What's the most challenging part of your job? LD: In the summertime it can be incredibly busy. I can have up to 30 stops per day, and somebody holds me up because they have a huge pest problem, or some little old lady wants to talk for an hour because she hasn't seen anybody for a month. Also, trying to get people to realize that their house is outside. I know that sounds obvious, but things are going to try to make a house out of your house. Pest control is not "extermination." Extermination doesn't exist unless you're wiping a species off the planet. I am not an exterminator. I am pest control. LD: Meeting new people. It sounds really cliché, but I've met a lot of really interesting people, to the point where we've become friends and hang out on weekends. Also, getting to know Vermont. I drive all over the place, and if I have 10 minutes for lunch, I'll sit down underneath a tree and get a couple of minutes to myself. There's a million awesome things about my job. Got an unusual job or know someone else who does? Let us know! ken@sevendaysvt.com.